The five-day Nepalese Hindu festival called Tihar started this week. 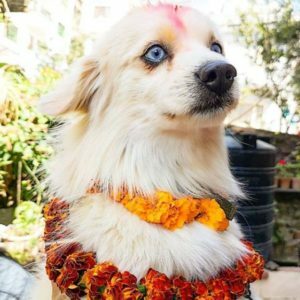 The second day is known as Kukur Tihar or “day of the dogs.” Dogs of all kinds, including strays, are blessed with a Tika — a red mark applied to their foreheads. The dogs are also gifted with flower garlands and offered food. Hindus believe that dogs are the messengers of Yamaraj, the god of death. If they keep the dogs in good spirits, it will keep Yamaraj happy. What an paw-some time for these pups! Read more. Last weekend’s New York City Marathon was an exciting race for the thousands who ran in it, but a few specific stories stood out. Kaitlyn Curran had just reached mile 16 when she saw her boyfriend, Dennis Galvin, get down on one knee and propose. After saying yes, Kaitlyn finished the race in just 4 hours and 24 minutes. And records were set for women marathoners when Mary Keitany from Kenya won the marathon in 2 hours, 22 minutes, and 48 seconds, the second-fastest time for this course in history. She’s also the second woman to win the marathon four times. The United States had four women finish in the top 10 this year. Plus, Daniel Romanchuk became the first American man to win the marathon’s wheelchair event. He was still coming down from his high of winning the Chicago Marathon a few weeks prior. At the age of 20, he is the youngest wheelchair athlete to win with a time of 1 hour, 36 minutes, and 21 seconds. Read more here, here, and here. Customers are lining up outside a California doughnut shop and buying up all the doughnuts every day for a good cause. John Chhan and his wife Stella have been running Donut City for three decades. Stella recently suffered an aneurysm andt is recovering in rehab. The Chhans’ customers wanted to set up a GoFundMe page to raise money, but all John wanted was time to spend with his wife. So, the customers have decided to buy out all the doughnuts early in the day so he can go visit his wife. They’ve spread the word and asked people to buy a dozen doughnuts at a time to close the store early. Not a bad reason to have an extra doughnut or two today. Read more. 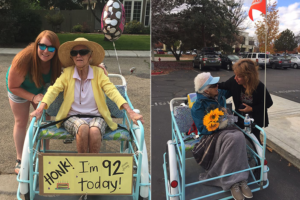 Ninety-two-year-old Rosemary Sorce has always loved riding bikes and was missing her daily rides. Hoping to bring some happiness to her mom, her daughter, Jill, scoured the internet and found a rusted cargo bike on Craigslist. She fixed it up and painted it blue. The bike allows Rosemary to ride in the front while someone pedals her around. People have even stopped the duo on the street to ask where they got the bike, which they’ve named the Blessing Bike. “This is lovely. I like the freedom to be able to go outside!” Rosemary said. “It makes you feel good and you feel loved! 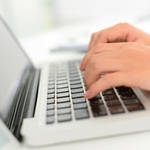 You’re not just sitting around.” Read more. A surge in voter turnout in Tuesday’s midterm elections meant that many voters were stuck in line for hours. A nonprofit organization called Pizza to the Polls came to the rescue of these diligent citizens, delivering pizza to people waiting in long lines to vote. All voters have to do is send a picture of themselves in line at a polling location and the nonprofit calls in a pizza delivery. Now that voters are fed, the organization hopes that voters will stay in line to cast their ballots. Read more.